I was initially hesitant to use non-dairy milk to make my french toast. But I went ahead and took the risk since hemp milk was all I had in the fridge. Well, I have to say I couldn’t tell the difference. And I just added a little sprinkle of mixed nuts and a few berries and it was breakfast heaven! 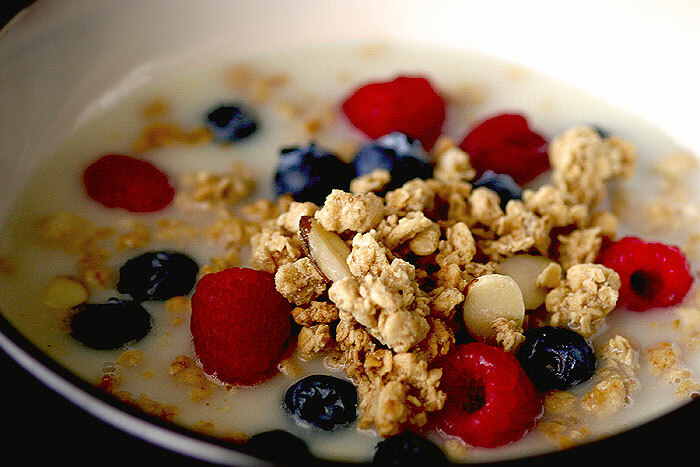 Simple, yummy and healthy… what more can you ask? In a wide-mouth bowl, whisk the eggs along with the milk, nuts, vanilla extract, cinnamon powder, salt, a tablespoon of cooled melted butter or EVOO and a tablespoon of pure maple syrup. Dip bread into mixture for 25-30 seconds on each side and set aside. Meanwhile, melt a dab of butter (or drizzle a little olive oil) in a medium-low heated skillet and cook each slice to golden brown, about 3-4 minutes on each side. 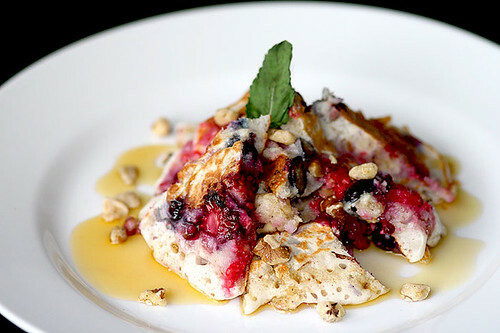 Serve with maple syrup and garnish with more nuts and/or fruit of your choice. Pure Maple SyrupIn a wide-mouth bowl, whisk the eggs along with the milk, nuts and salt. Dip bread into mixture for at least 30 seconds on each side. Melt a dab of butter in a medium-low heated skillet and cook each slice to golden brown, about 3 minutes on each side. 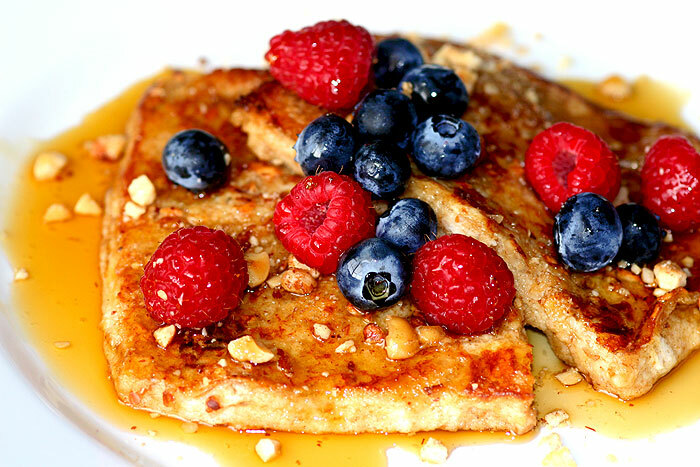 Serve with maple syrup and garnish with more nuts and/or fruit of your choice. Kiwano, it says. A ki-what-now? This thing looks deadly with its spikes but I gotta admit it got the best of me when I grabbed one thinking, I’ve got to at least give it a try. I had no idea what I’m in for with this strange looking mutant but for 4 buck a pop, it’s gotta be good, I thought. All I can think of is… you gotta be kidding me! Almost flavorless and whatever hint of flavor it has wasn’t even fruit-like. And the seeds! The seeds! You really want to spit them out but it’s impossible to do. I mean, you might as well not eat the fruit at all, y’know! Which, evidently, wasn’t such a bad idea at this point. It was 4 bucks down the drain but, oh well. At least, there’s one less fruit I have to decide on, next time. Glad to, at least, have the strawberries around to please my morning palate and save the day. 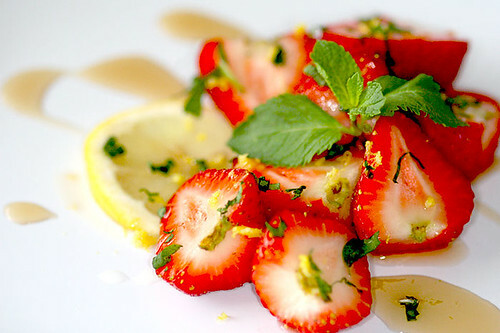 A little drizzle of lemon juice, some lemon zest, chopped mint to garnish and a drizzle of pure maple syrup. Ahh… now, that’s redeeming!